Fig. 41 Demand management. 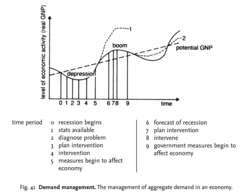 The management of aggregate demand in an economy. The control of the level of AGGREGATE DEMAND in an economy, using FISCAL POLICY and MONETARY POLICY to moderate or eliminate fluctuations in the level of economic activity associated with the BUSINESS CYCLE. The general objective of demand management is to ‘fine-tune’ aggregate demand so that it is neither deficient relative to POTENTIAL GROSS NATIONAL PRODUCT (thereby avoiding a loss of output and UNEMPLOYMENT) nor overfull (thereby avoiding INFLATION). An unregulated economy will tend to go through periods of depression and boom as indicated by the continuous line in Fig. 41. Governments generally try to smooth out such fluctuations by stimulating aggregate demand when the economy is depressed and reducing aggregate demand when the economy is over-heating. Ideally, the government would wish to manage aggregate demand so that it grows exactly in line with the underlying growth of potential GNP, the dashed line in Fig. 41, exactly offsetting the amplitude of troughs and peaks of the business cycle. the establishment of the correct magnitude of an injection or withdrawal into the economy (to counter depressions and booms). With perfect timing and magnitude, the economy would follow the trend line of potential GNP. A number of stages are involved in applying a stabilization policy as shown in the figure. For example, at time period zero the onset of a recession/depression would be reflected in a downturn in economic activity, although delays in the collection of economic statistics means that it is often time period 1 before data becomes available about unemployment rates, etc. Once sufficient data is to hand, the authorities are able to diagnose the nature of the problem (time period 2) and to plan appropriate intervention, such as tax cuts or increases in government expenditure (time period 3). At time period 4, the agreed measures are then implemented, although it may take some time before these measures have an effect on CONSUMPTION, INVESTMENT, IMPORTS, etc. (see MULTIPLIER). If the timing of these activities is incorrect, then the authorities may find that they have stimulated the economy at a time when it was already beginning to recover from recession/depression, so that their actions have served to exacerbate the original fluctuation (dotted line 1 in Fig. 41). The authorities could also exacerbate the fluctuation (dotted line 1) if they get the magnitudes wrong by injecting too much purchasing power into the economy, creating conditions of excess demand. If the authorities can get the timing and magnitudes correct, then they should be able to counterbalance the effects of recession/ depression and follow the path indicated as dotted line 2 in Fig. 41. Reducing the intensity of the recession in this way requires the authorities to FORECAST accurately the onset of recession some time ahead, perhaps while the economy is still buoyant (time period 6). On the basis of these forecasts, the authorities can then plan their intervention to stimulate the economy (time period 7), activate these measures (time period 8), so that these measures begin to take effect and stimulate the economy as economic activity levels fall (time period 9). Much government action is inaccurate in timing because of the institutional and behavioural complexities of the economy. Where the government has not been successful in adequately eradicating such peaks and troughs in the business cycle, it is frequently accused of having stop-go policies (see STOP-GO CYCLE), that is, of making injections into a recovering economy, which then ‘overheats’, and subsequently withdrawing too much at the wrong time, ‘braking’ too hard. Demand management represents one facet of government macroeconomic policy, other important considerations being SUPPLY-SIDE policies, which affect the rate of growth of potential GNP, and EXCHANGE RATE policies, which affect the competitiveness of internationally traded goods and services. See DEFLATIONARY GAP, INFLATIONARY GAP, EQUILIBRIUM LEVEL OF NATIONAL INCOME, AUTOMATIC ( BUILT-IN) STABILIZERS, INTERNAL-EXTERNAL BALANCE MODEL, PUBLIC FINANCE, BUDGET. JustEnough said the power of the Mi9 solutions combined with JustEnough's enterprise retail planning and demand management will give retailers the ability to optimise their entire supply chain planning process with a single solution vendor. MPBS s'y est resolue avec l'aide du partenaire technologique local de Demand Management, [beaucoup moins que]Integrated Business Planning Solutions (INBUPS). Demand management is an important strategic, integrative, and complex supply chain management process (Croxton et al. The Demand Management Program is an extension of Con Edison's Commercial & Industrial Energy Efficiency Rebate Program, a new strategy that offers incentives to Con Edison customers that utilize energy-efficient technology to reduce the system-coincident peak demand during the summer months. Water demand management consists of non-structural measures . Our survey focused on these key areas of inquiry: (1) most important demand-management challenges facing companies; (2) demand management integration with other related business systems; (3) best practices in demand management; and (4) key issues around demand forecast accuracy. However, with leaders from the public and private sectors working in partnership, we have an excellent opportunity, with a successful TIF bid, really to understand whether demand management can indeed play an important role in helping reduce the cost of congestion. Sanderson discussed some of the lessons learned from his own experiences and engagements, and provided insights on the next steps going forward in demand management. Instead, governments should be exploring demand management options. The cost-effective application of demand management may produce a whole new generation of financially successful providers. Planners will no longer have to hand off their information to others during the S&OP process," said Bill Harrison, president of Demand Management. Demand Management Inc, a resource company for software, support, services and training for manufacturing, distribution and retail operations and a wholly owned subsidiary of Logility Inc (NASDAQ: LGTY), declared on 18 November that the Microsoft Partner Program has given the company a Gold Certified Partner status with a competency in ISV/Software Solutions.